“As practical training moves from a buzzword into actual practice, more law schools are delivering on their promise to prepare graduates to hit the ground running,” The National Jurist writes. Schools are ranked based on the number of full-time students who participate in simulation courses, externships and clinics. This year, the study also examined student participation in interscholastic skills competitions, such as moot court tournaments. Schools were also awarded extra points for pro bono work. Wake Forest Law has an active Pro Bono Project, with students completing projects ranging from advance directives to criminal law to writing wills. Visit Wake Forest Law for more information on these programs. 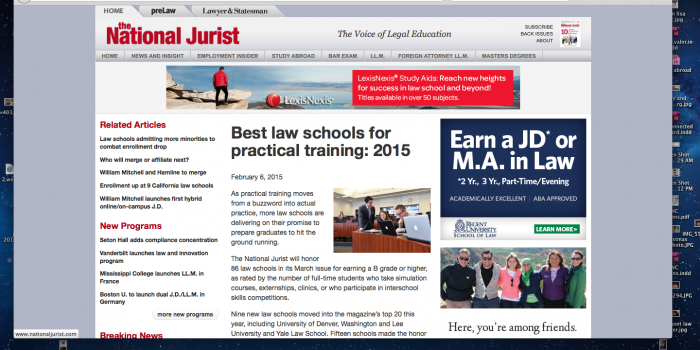 View the original article in The National Jurist here.